This 1967 LP from my collection draws together several current paths. 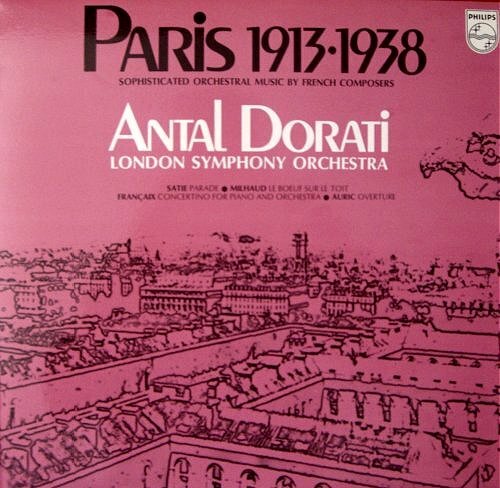 The conductor is Antal Dorati, and we mark the twentieth anniversary of his death on November 13. The orchestra is the London Symphony, which reminds us of the recent contribution by a reader lamenting the decline of that orchestra under the leadership of Valery Gergiev. And the main work on the LP is Darius Mihaud's Le Boeuf sur le Toit, an early example of jazz meeting classical. Milhaud's score dates from 1919 and was used to accompany a farce created by Jean Cocteau and set in an American bar during Prohibition. Today, Milhaud's ranking as a minor composer belies his influence; his students included Karlheinz Stockhausen, Steve Reich and Philip Glass. The jazz meets classical path was started by Radka Toneff's exquisite album Fairytales. This 1982 classic of the gramophone features just two musicians, Radka Toneff and pianist Steve Dobrogosz. The latter also composed two of the songs, including the haunting final I Read My Sentence. Steve was born in North Carolina in 1956 and trained as a classical pianist before moving to Sweden in the late 1970's. After a decade working in the Scandinavian jazz scene he started composing for the classic forces of orchestra and choir. His compositions are performed around the world and his 1992 Mass, featured in the video below, has been heard by thousands. Steve Dobrogosz's music is tonal, tuneful, honest and hugely popular. So is that of John Rutter, Eric Whitacre, Howard Goodall and Morten Lauridsen. But the music blogs, including this one, routinely ignore or even disparage their output; despite the fact that it provides a vital stepping-stone to Mahler and Messiaen. In the last century Carl Orff's Schulwerk (School Music) and Paul Hindemith's Gebrauchsmusik (Utility Music) were created to reach new audiences. But these concepts are now as deeply unfashionable as the tonal music by contemporary composers that is performed by amateur (and professional) forces around the world every day. The hip music blogs enthuse over hot new ideas such as Second Life orchestras and classical music nightclubs. Aren't we all missing the point that Eric Whitacre outsells Mozart, yet alone John Adams? What the heck? Why would people disparage Morton Lauridson? His "O Magnum Mysterium" is one of the most beautiful things I have ever heard, honestly. Milhaud wasn't a minor composer, though with 443 uneven opus numbers anyone can be forgiven for thinking so. His second violin concerto is as good as anything by Walton or Hindemith (very Waltonian in parts): one of the major unknown concerti of the 20th c. You MUST hear or get to know (right now) if you don't yet the 1949 recording with Louis Kaufman, Milhaud conducting.